In preparation for the Boston Celebration of CARP’s 50th Anniversary taking place this Saturday, November 19th, today’s Throwback Thursday is a testimony from CARP Boston alumnus and now a member of the CARP Board of Directors, Markus Karr. “I grew up in Kansas City and got accepted to MIT in Boston, so that was exciting for me and my parents. But it was far away from homeand it was a rigorous, competitive school. It was a shock to the system, not only for me but for other freshmen, too. They didn’t even give letter grades to freshmen because students were so worried about getting B’s. It was a tough environment. Being so far away from my parents, it woke me up to the real world. Towards the end of my freshman year, I was stopped on the street by a lady who asked me if I believed in God and what my beliefs were. She invited me to the CARP Boston center where I attended evening programs about once a week and learned about the Divine Principle from Steve Pecarsky. At some point, I was given my own copy of the Divine Principle and I remember staying up all night reading it. MIT is a science and tech school and I was a nerdy, computer geek. My dad was a high school teacher and my mother had a solid Christian faith that I greatly respected. I never really considered rejecting a belief in God, but I didn’t have any interest in “mysteries of faith” or inexplainable phenomenon. One of the main things that drew me in (other than the real, genuine warmth and parental heart of the CARP community) was the Divine Principle’s attempt to unite science and religion. It got me! I liked the logic and systematic nature of explaining how the world works and God’s relationship with the world, humanity, and why bad things happen. Coming from an engineering background, I liked that the Principle built a model I could use to see and analyze behavior in the real world. I could understand it from the point of view of human nature. I was always very much drawn to the intellectual rigor and solid foundation of the teaching. It was what kept me going. I attended a summer CARP workshop and in my sophomore year, I registered a CARP club on my campus. This was before the fall of the Soviet Union so we did some events on campus related to that (which was a huge CARP campaign at the time). I lived in the CARP center together with about a dozen other students and we hosted evening programs each weekday night, Monday through Friday. 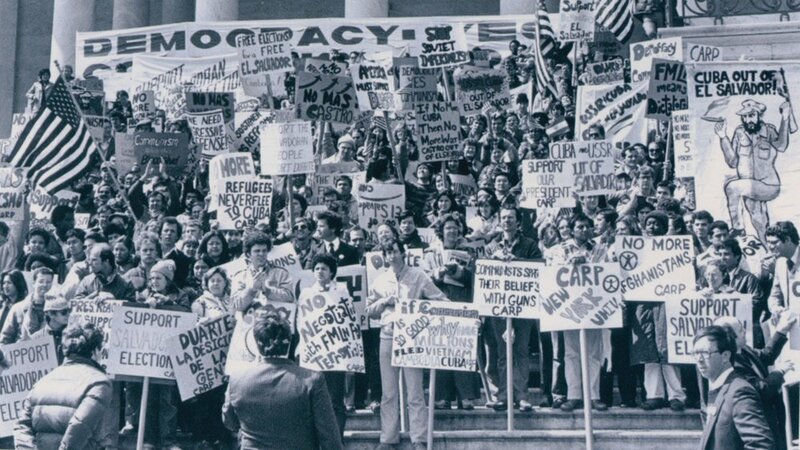 In the 1980s, CARP members often campaigned against the spread of communism. Occasionally we would drive down to Belvedere in New York to hear Father Moon, who often gave Sunday Services at that time. The first time I saw him speak was in August of 1987. For me, it was sometimes difficult and challenging to try and pursue this other side of lifeduring my academic years, especially in the middle of a very intense program. But it’s very important because it does expand your mental and intellectual capabilities. It gives you resources and tools for the rest of your life. The Principle emphasizes that we can’t just go down one narrow path and ignore the other aspects of our lives like the spiritual aspect, by way of a relationship with God and a relationship with the universe. I think it’s important, especially in our very secular-learning culture (especially on campus) to allocate time and resources of our lives to these bigger picture components: the existence of God, good and evil, and our purpose in life beyond career and money. Try to have holistic, well-rounded pursuits. In my opinion, that’s what the Divine Principle is all about and that’s what CARP can provide students at this time in their life – a great balance to academic, scholarly pursuits. I graduated in 1989 and got blessed in 1992. I owe my whole family to that experience.